philippianpix | Things are ALWAYS happening around St. Philip’s. Here's just a sampling of some of what you might have missed. Things are ALWAYS happening around St. Philip’s. Here's just a sampling of some of what you might have missed. Busy, busy! Things are bustling around St. Philip’s, and the stack of photos is mounting (digitally) with no time to sit and post them for the multitudes. 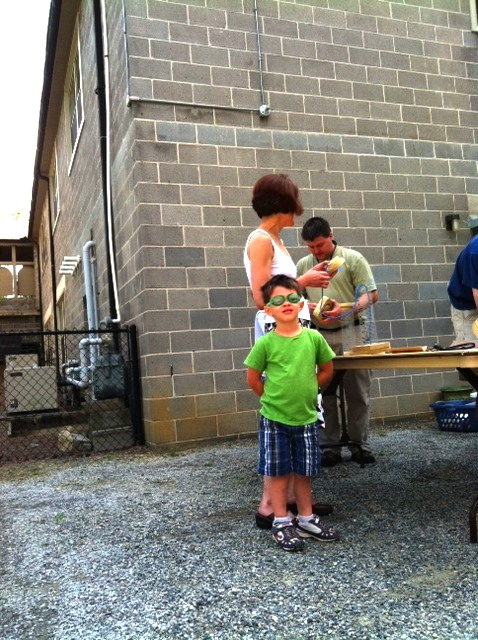 Let’s see if we can’t celebrate some of the good that’s going on at St. Philip’s and get a few photos up and moving! Discipline, discipline. The photos are stacking up, and there’s no real theme to them, except St. Philippians are working hard to make a difference, both near and far, recently and several months ago! 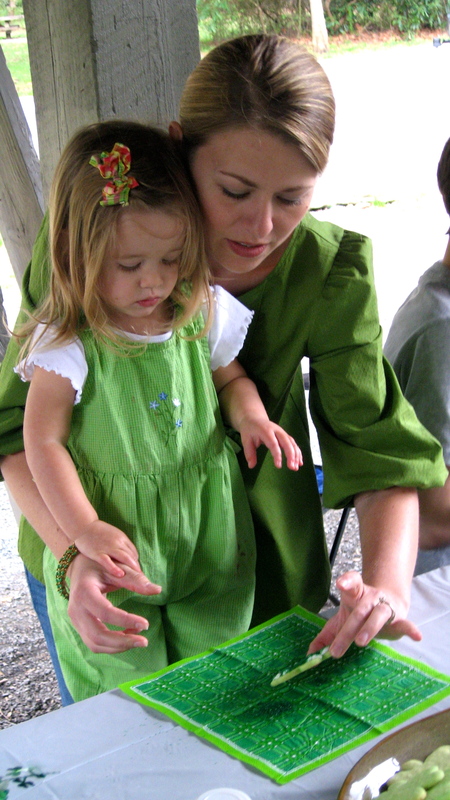 Let’s make a dent in the digital photo files! Most recently, on November 4, 2012, this crowd created an amazing reception for the Bishop and the newly baptized, confirmed, received, and renewed. It was a big crowd of honorees (over 20! 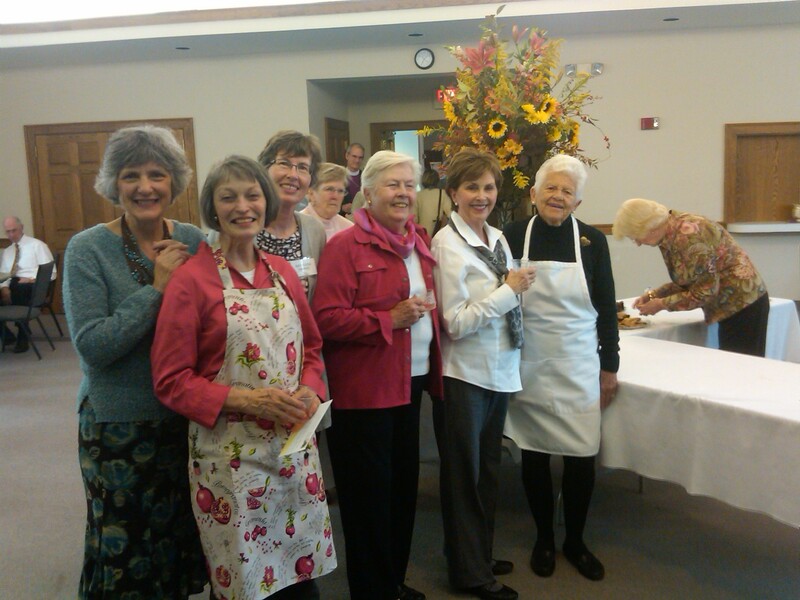 ), and these ladies put on a fabulous do for the well-wishers and the guests of honor. 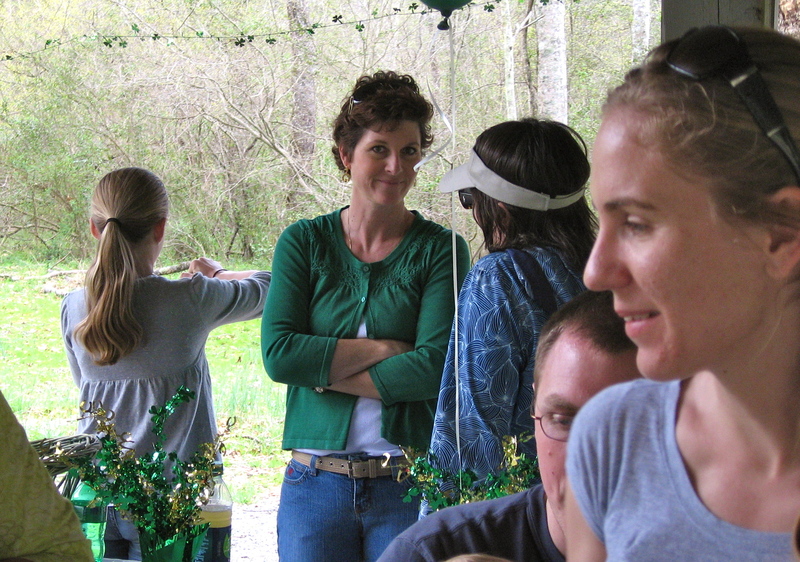 Can you see our Bishop peeking over from behind the crowd? 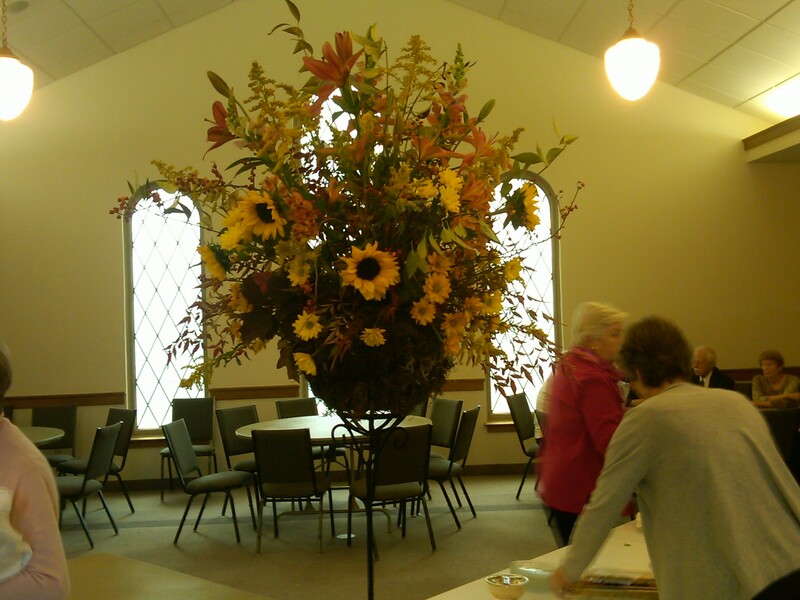 Dianne created the beautiful arrangement seen here and in the upper left of this post. On September 11, 2012, we had one of the first cold snaps here. That didn’t slow down our Grounds Committee. 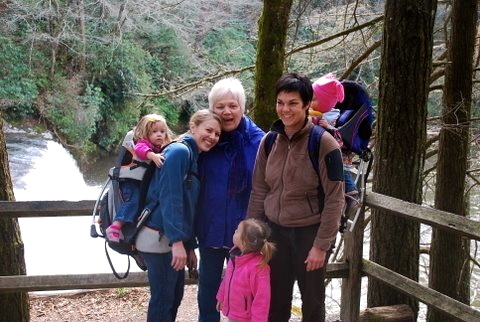 These people have too much fun to stay warm at home, enjoying a second cup of coffee. 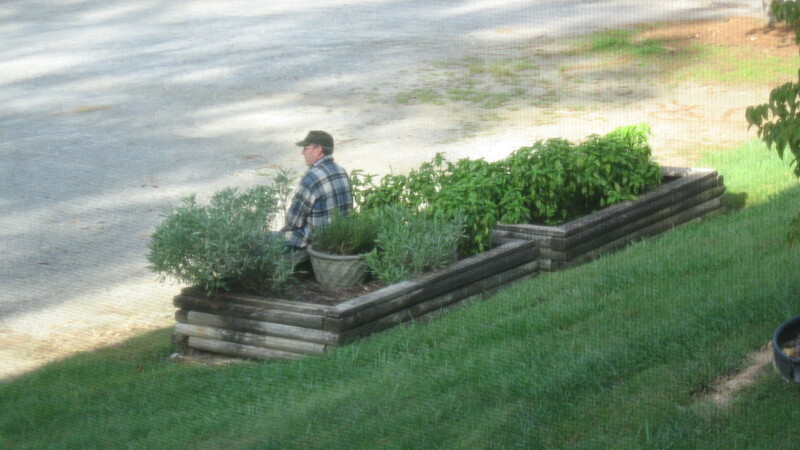 Bruce arrived a bit earlier than the rest, and was spied sitting among the basil, waiting for the rest of the troops to arrive. Now we can move into the “far away” category. 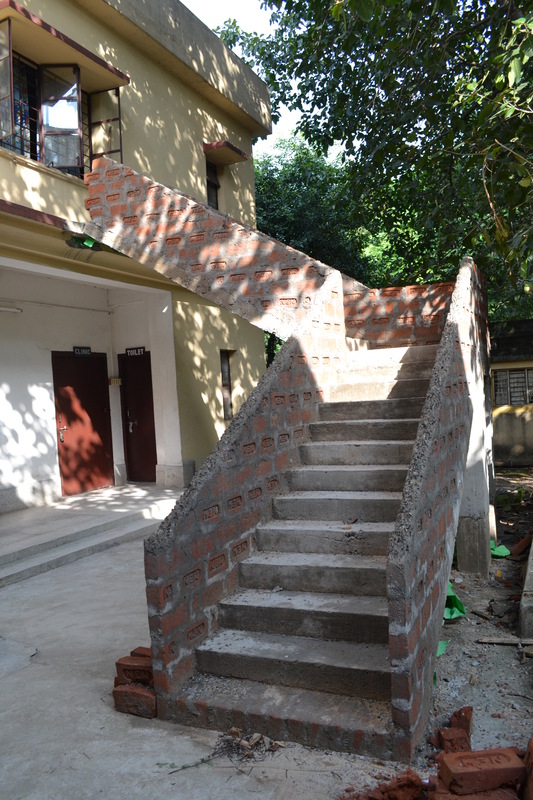 St. Philippians are making it possible for this emergency exit staircase to be built at the hostel for children in our companion diocese in Durgapur, India. 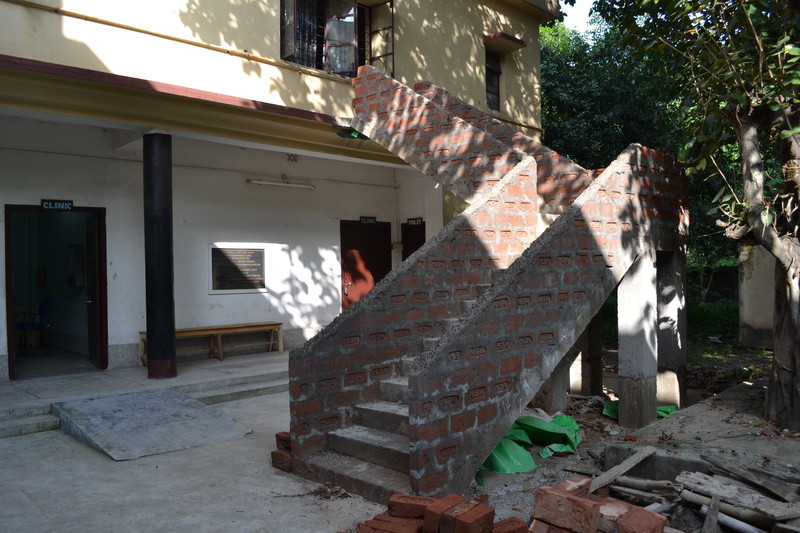 We hope to have a photo of the completed staircase when the team visits in February 2013! My goodness! 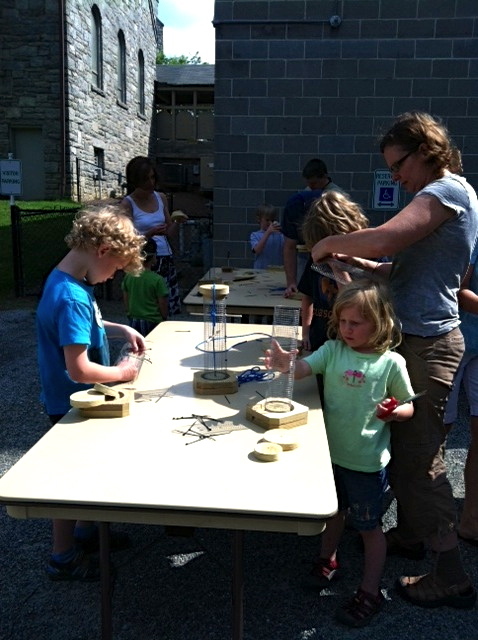 Things around St. Philip’s have been so busy that there hasn’t been any time at all to post about how busy it is! That’s a good thing, in my book: let’s fill up the building around the clock with people doing good things and worshiping together! First off, look at these two boards in the parish hall foyer. 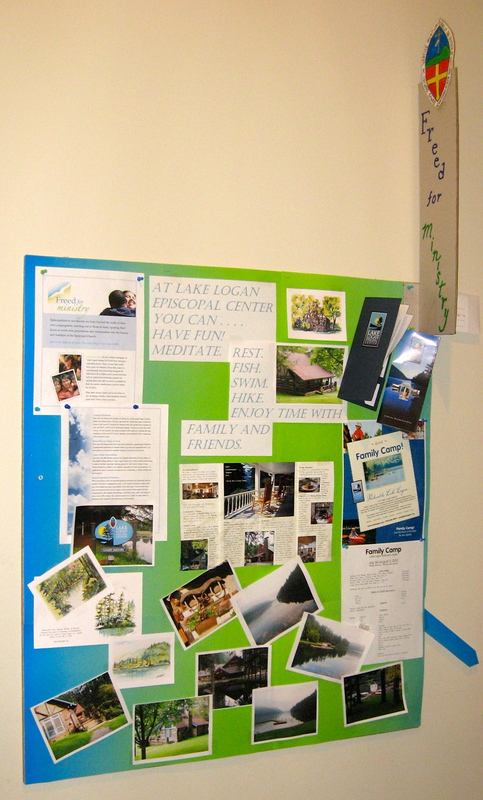 One illustrates aspects of the Lake Logan “Freed for Ministry” campaign (and whoever designed the little three-dimensional sign jutting out from the bulletin board is a marketing genius!). 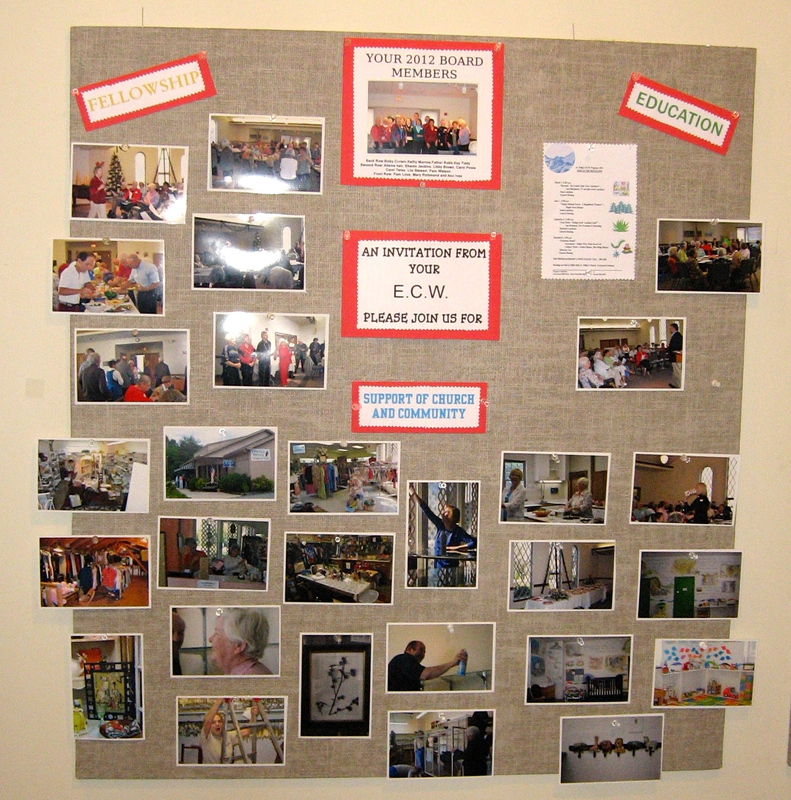 The second board illustrates the ECW (Episcopal Church Women) and all of the good things they do and good activities they have. Now, you might wonder why they got to have a whole board to advertise their activities: they do because June was the ECW’s month to be featured as the Ministry of the Month. For ten months of the year each section of the Minisphere gets their chance to shine with space on this bulletin board, The Messenger, and The E-pistle. 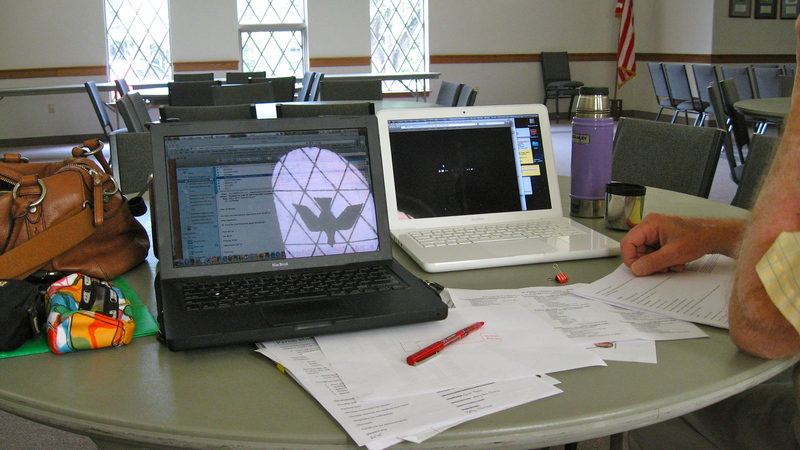 If you don’t know when your month is coming up, ask your Parish Ministry Council chair or e-mail the E-pistle! 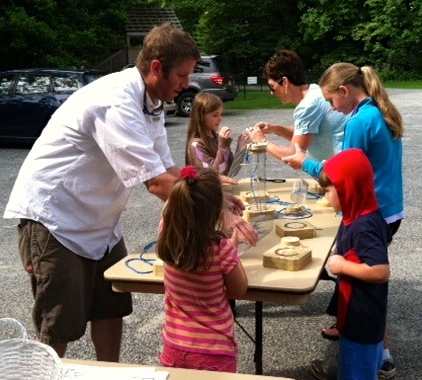 On June 16, 2012, a crowd materialized in the back parking lot to make restaurants for our feathered friends! 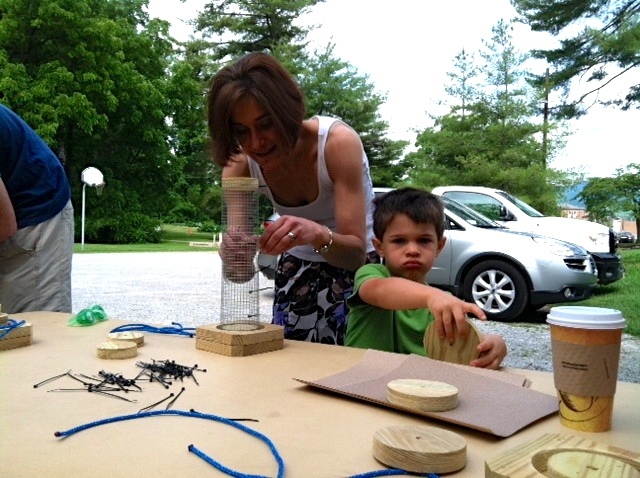 The Father’s Day Craft was a great success. 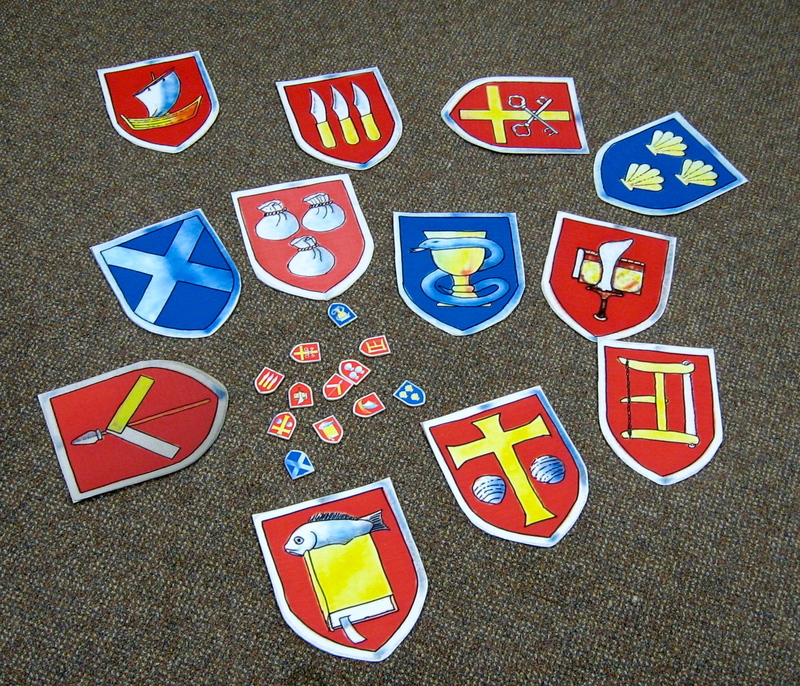 Children and their helpers assembled original kits prepared for them by the Shobers. And, voilà! We have a birdfeeder! Despite my good intentions, time slips away and the Official Photo Lab of the PhilippianPix blog languishes with no attention. My apologies! First off, the Supper Club crowd has been working up a storm in Miller Hall for the June 8 “Selebrate Summer” Supper Club – no tumbleweed was left unturned to create a great atmosphere for some Texas barbecue! 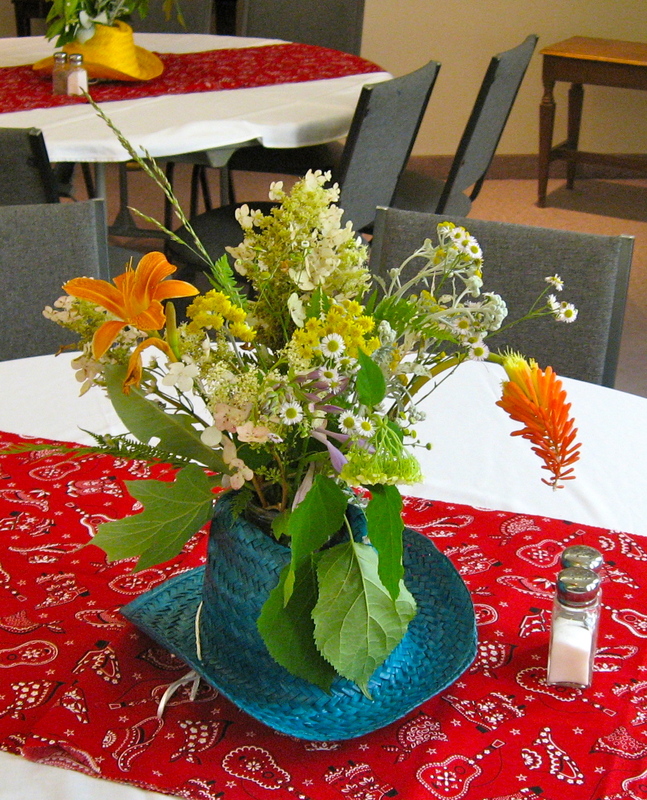 The flowers were fresh picked and nestled in their cowboy hats, awaiting the big night. 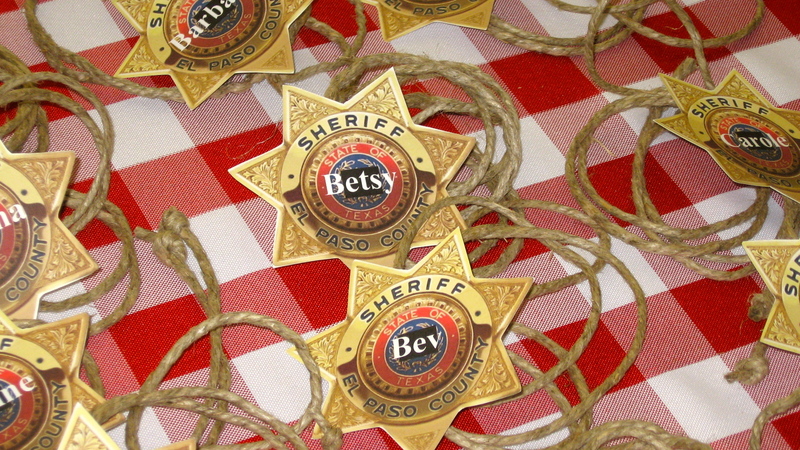 That crowd was expecting a mess of sheriffs…. 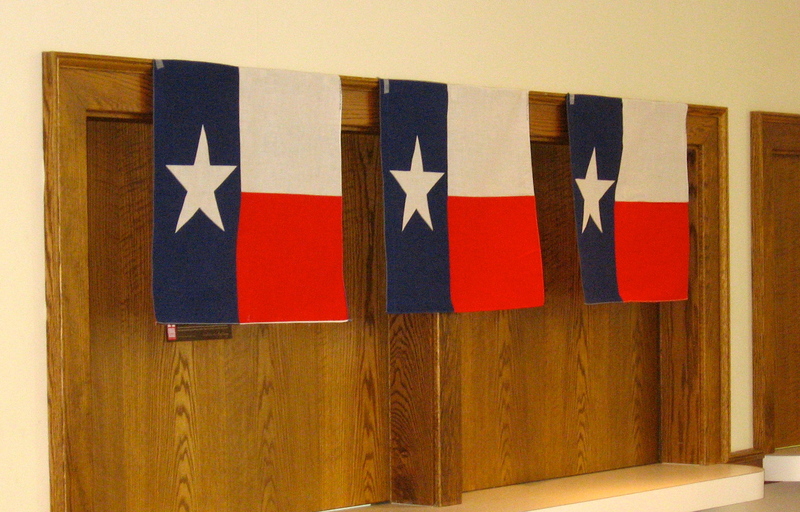 And the Lone Star State never looked so good! Miller Hall isn’t just about large groups. 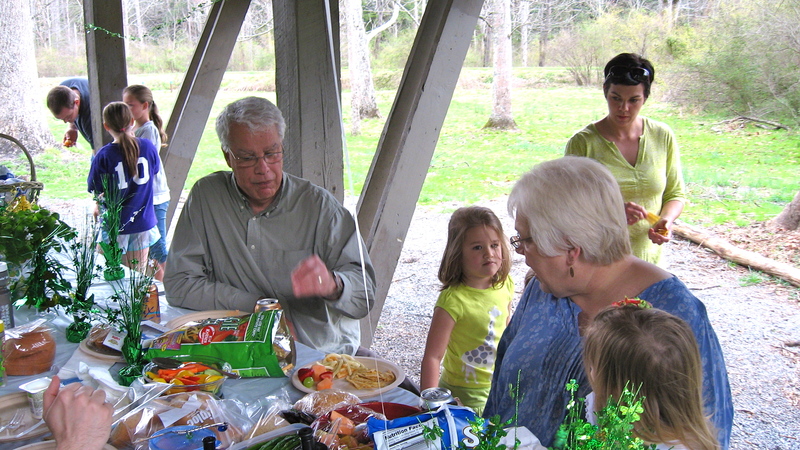 Occasionally small groups – crowds of two! – meet for a bit if the other rooms are filled already. 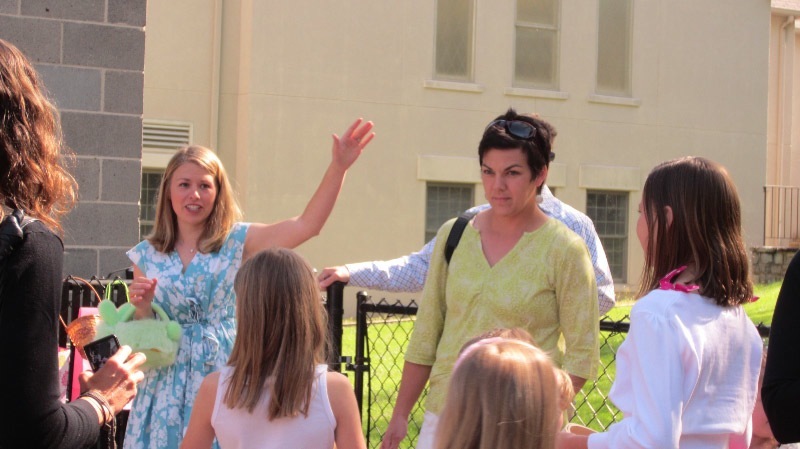 The Electronic Communications Committee met to discuss updates to the St. Philip’s Website (www.stphilipsbrevard.org). Other meetings are a blur of activity. 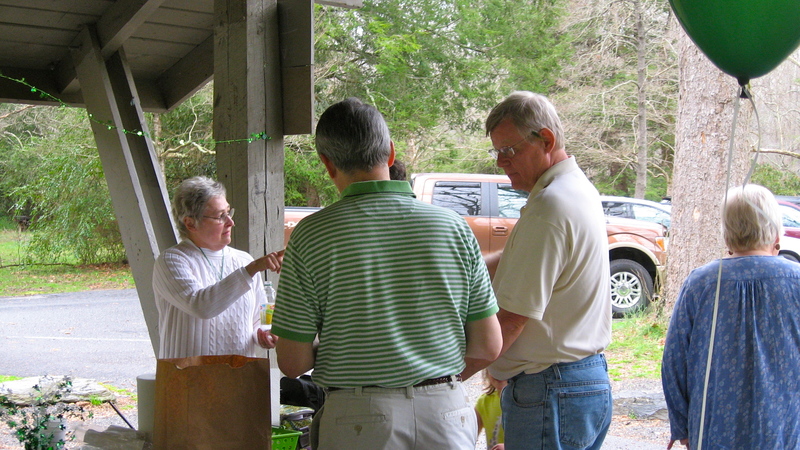 The EPP (Episcopal Parish Programming) has been working very hard all spring to create fellowship events such as the All Parish Hike, the First Annual Easter Egg Hunt, and the Spring Parish Picnic at Lake Atagahi. Meetings with this crowd are a blur of activity! 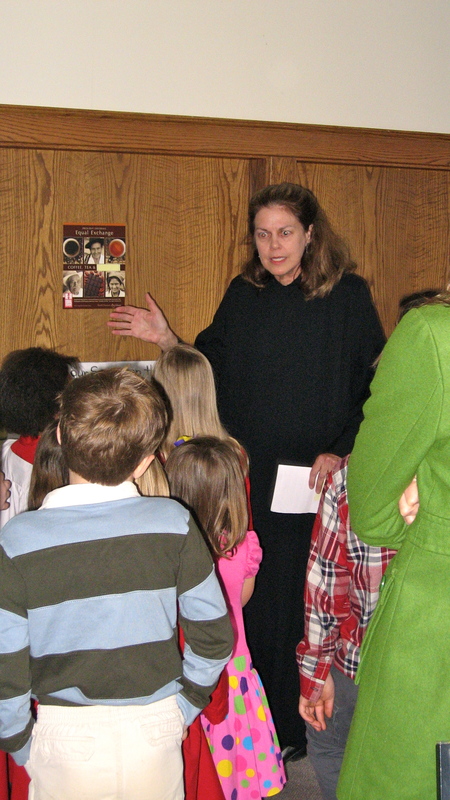 Since the Sunday School Recognition took place one week before Pentecost, the Godly Play teachers “blew up” the Pentecost story for the event. 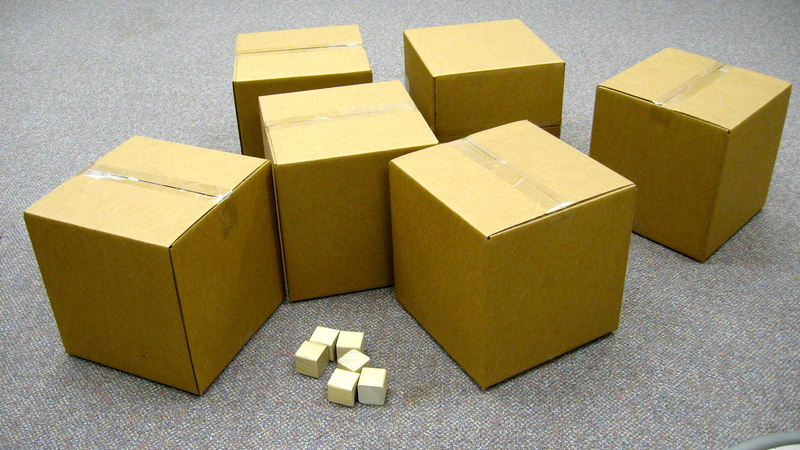 The little blocks (and the “blown up” big blocks!) represent the Tower of Babel in the story, when the language of the People of God was fractured. 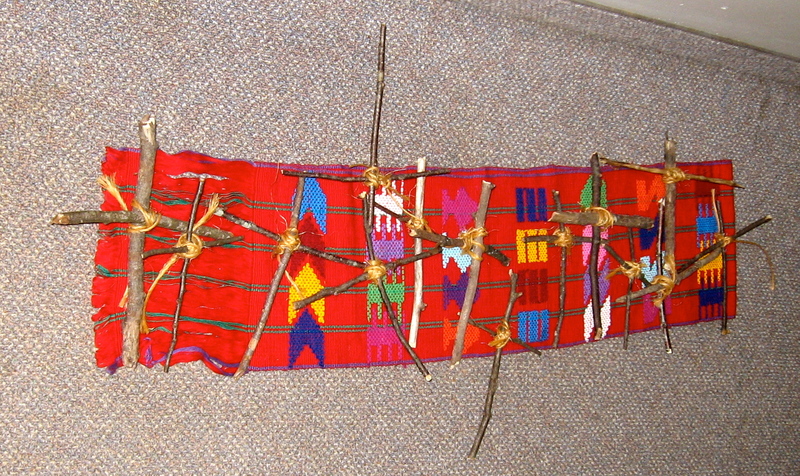 The story of Pentecost then jumps forward to the disciples (represented by their shields) receiving the Holy Spirit at Pentecost – when it no longer mattered that they spoke different languages. 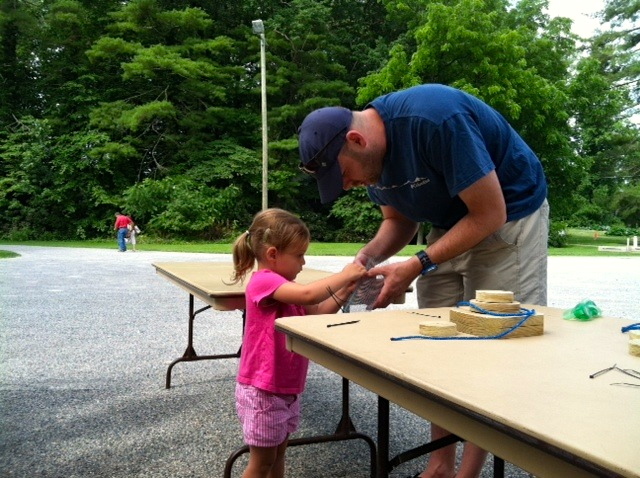 Each year, the children receive a small token gift at Sunday School Recognition. 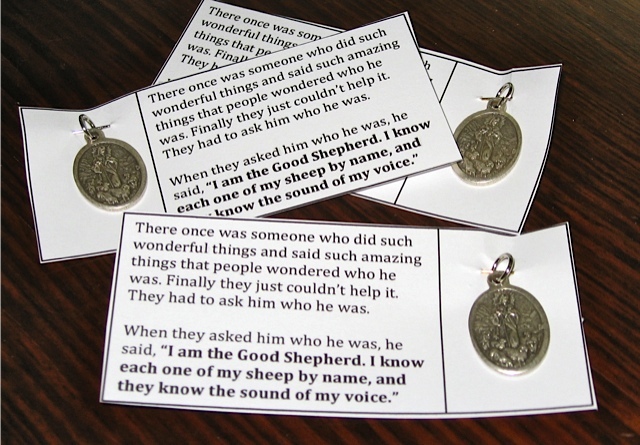 Since the story of the Good Shepherd is a core part of the program, each child and teacher received one of these. 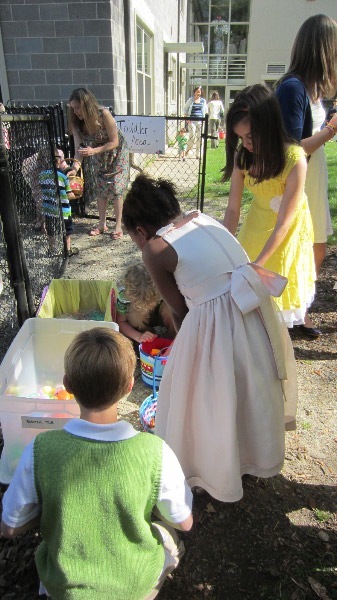 The First Annual St. Philip’s Easter Egg Hunt was a great success! 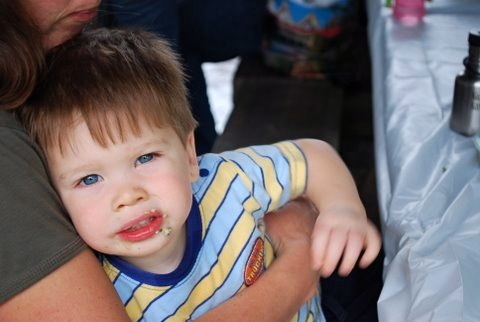 You can click here to see more pictures of the event, but Bonnie Jensen deserves a gold star for attending the event and creating this short movie for us all to enjoy! 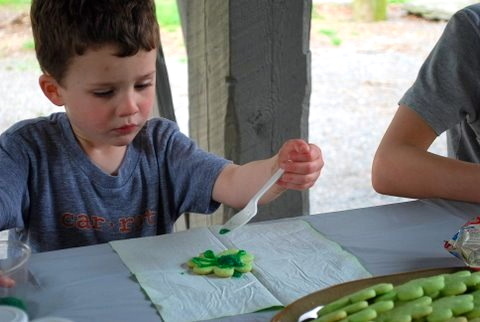 If you like what you see, please make every effort to attend the next meeting of the EPP (Episcopal Parish Programming) at St. Philip’s to help plan more fellowship events like this one. So, it’s Easter weekend, and you’re sitting around relaxing in your slippers and pajamas, watching an old western on TV, and the first thought that pops into your head is, “I think I’d like to put some things together!” Well, perhaps you didn’t think that, but at least one person did. 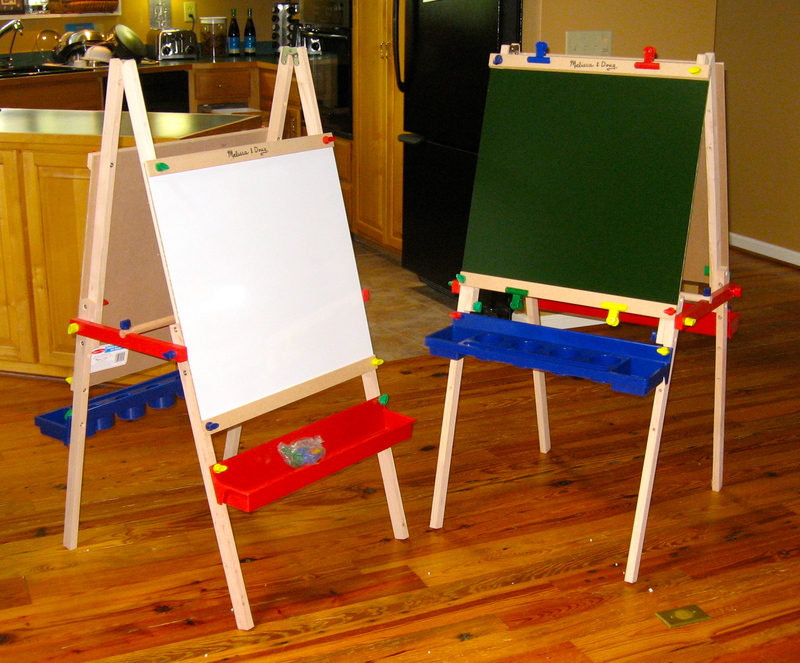 Our Godly Play children will have the opportunity to paint with “big paints” as they work with the Bible stories in class. 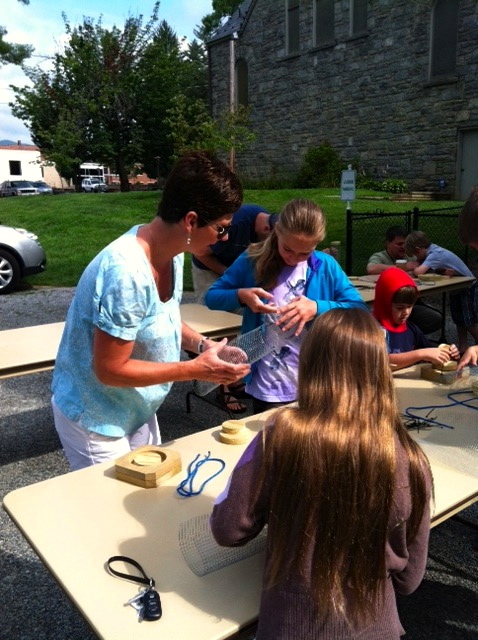 We are thankful for all the helping hands that do so many unseen things for St. Philip’s all week long. I wish I had more pictures of these unseen helping hands. I had the opportunity to be alone in the church on Holy Saturday in the late afternoon. The quiet, peaceful church was absolutely breathtaking with all the lilies and sunlight streaming through the windows. Please imagine that picture and give thanks for the people who make our worship space beautiful each week. 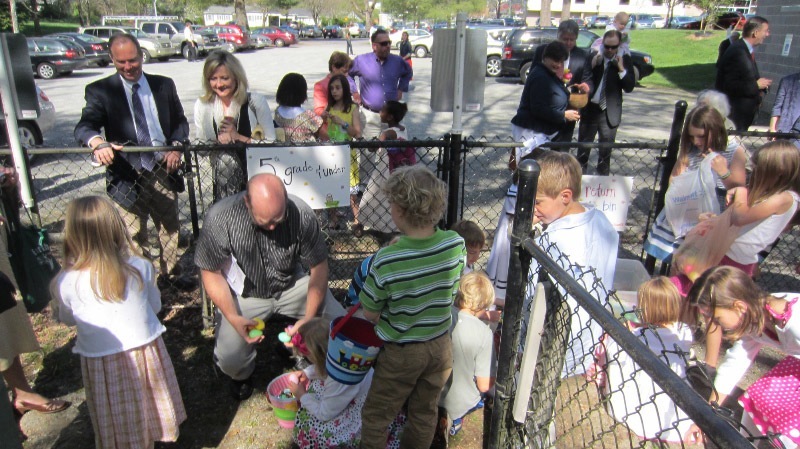 Other unseen hands spent time planning the First Annual Easter Egg Hunt at St. Philip’s! 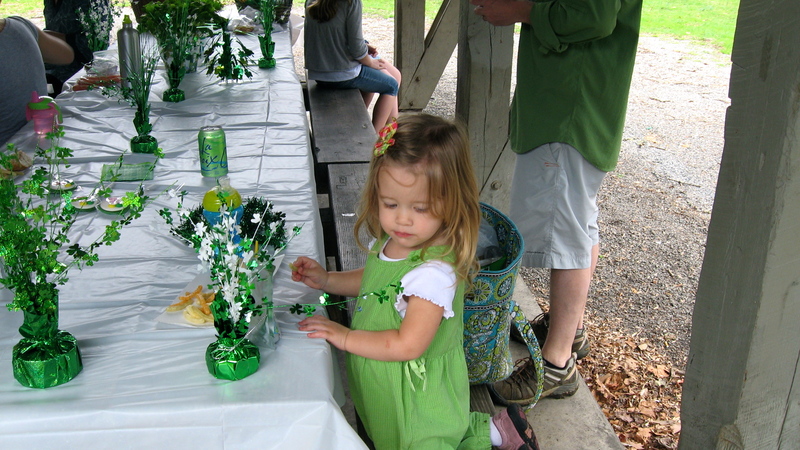 There were lots of gatherings to prepare for the event: an Egg Stuffing Party and a Playground Raking Party. On Easter Sunday everything was prepared and ready to go! 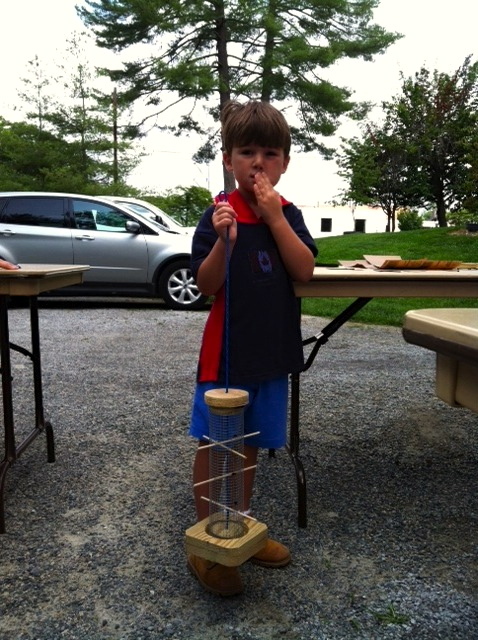 Interested St. Philippians milled around the parking lot, watching the festivities. 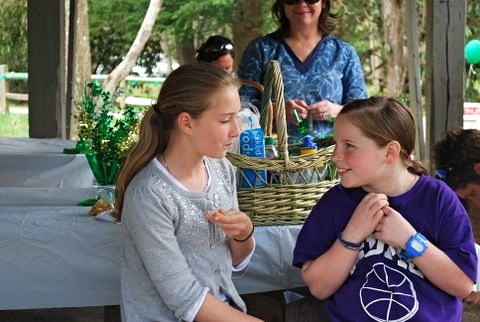 Before the Hunt started, Kate and Shannon laid out the ground rules and got the hunter/gatherers primed. And hunt they did! 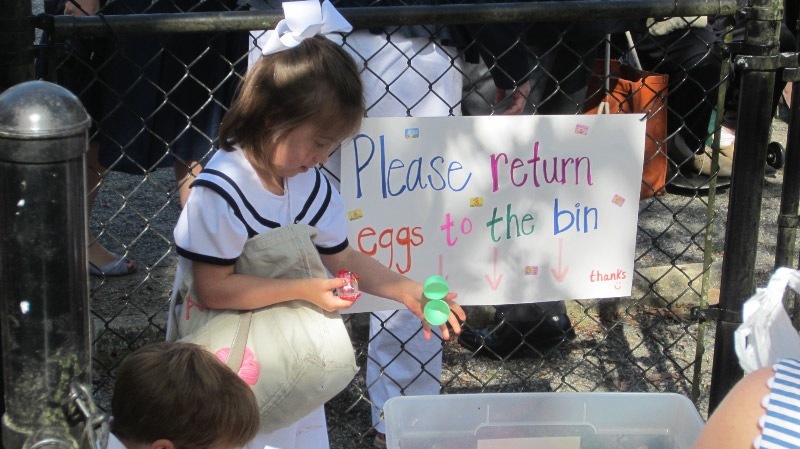 There were approximately 700 eggs to find in the “triangle yard” and the playground. 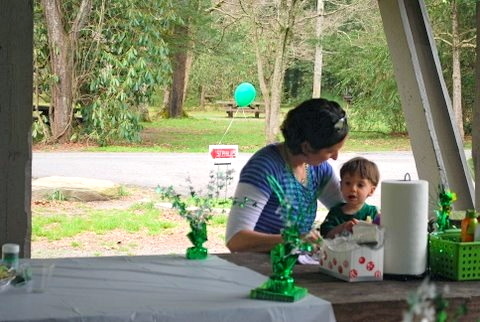 One particular quirk of this Hunt was that the eggs had to be returned at the end (not to worry: our hunters were able to keep the consumable treats inside). 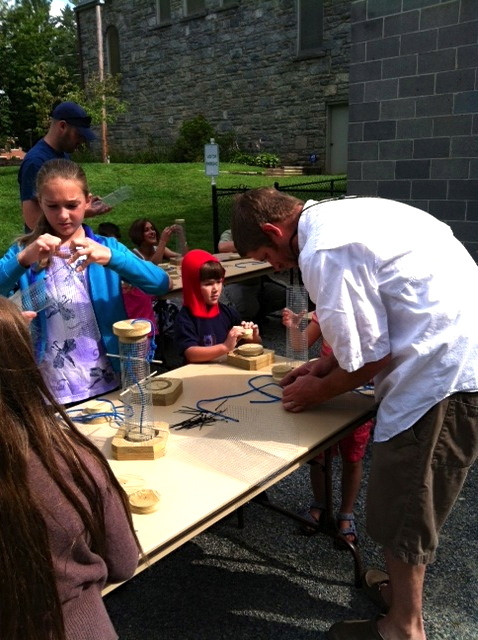 Many thanks to Grant and Camp Gwynn Valley for loaning the eggs and helping us keep this event green! 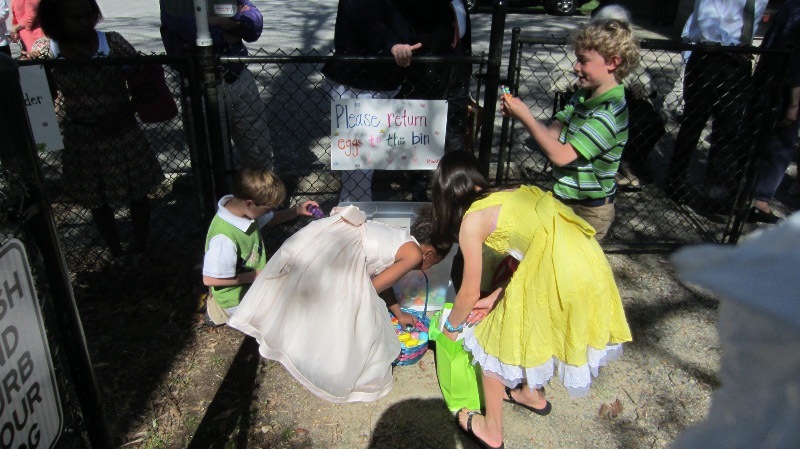 Many thanks to Bonnie Jensen for the pictures of the Egg Hunt! There’s lots of small fry around the church, but sometimes they move so fast they’re hard to see. However, the St. Philip’s nursery is displaying some new artwork to help the caregivers in the nursery remember names and ages. Folks, there are TWENTY NAMES in that school of fish! 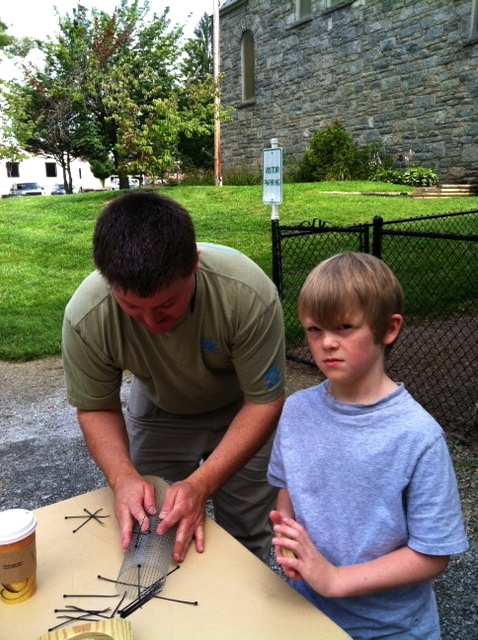 And Chris tells me they have a few more fish to add to the display as soon as they check with the mothers and fathers. You can read in The Messenger and in the Bulletins and have a good idea of some of the people who head this committee or that one. 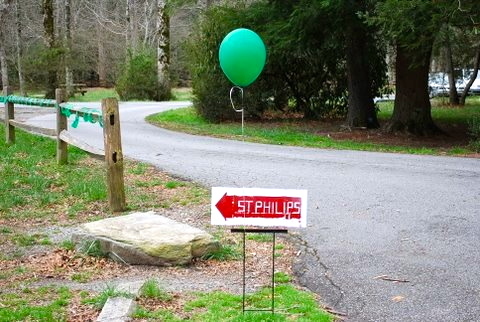 However, St. Philip’s is chock full of people who are willing to show up and get a job done. Recently, a group of men responded to the request to empty out Miller Hall so that the labyrinth could be put down. No committee, no fanfare – just showing up and getting the work done. And not everyone may know that St. Philip’s has a full size labyrinth. 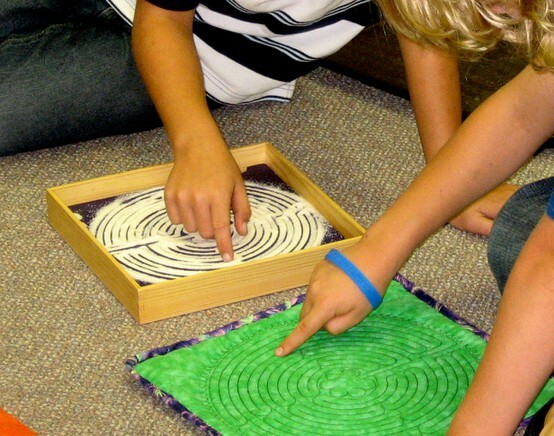 The labyrinth was available for several days in Lent. 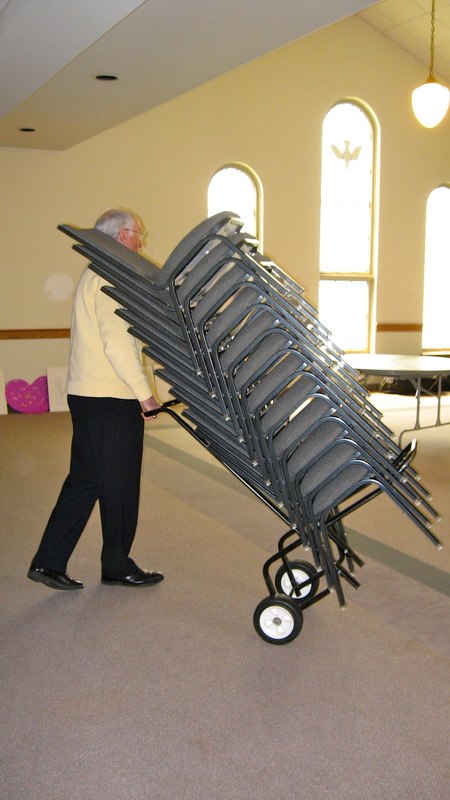 While everyone loves the hustle and bustle of a good parish dinner, there is also the need to retire and replenish. The labyrinth is a quiet, calm, peaceful way to do that. 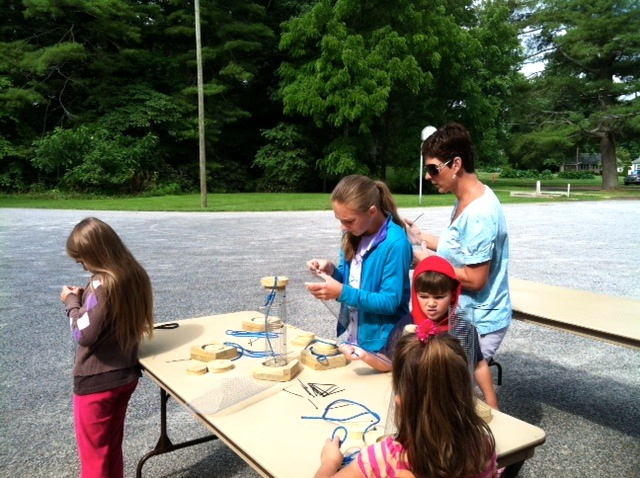 You might also be surprised to learn that the labyrinth is not popular just with the adults. 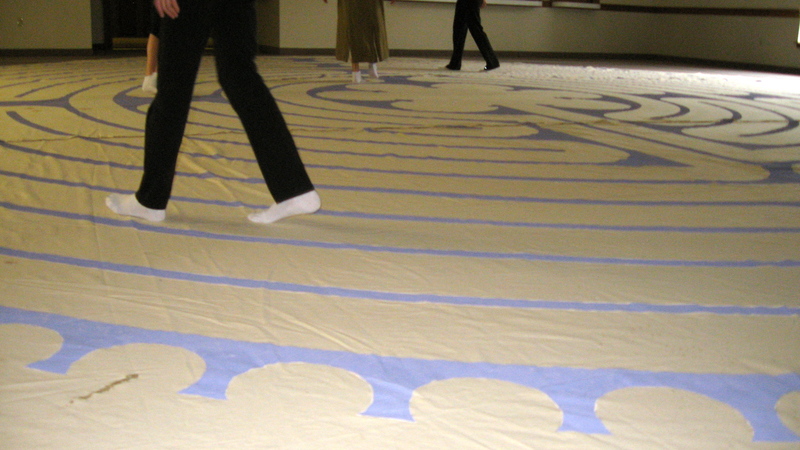 The teens in EYC had the opportunity to walk it, as well – many of them are familiar with labyrinths from the diocesan retreats they attend. 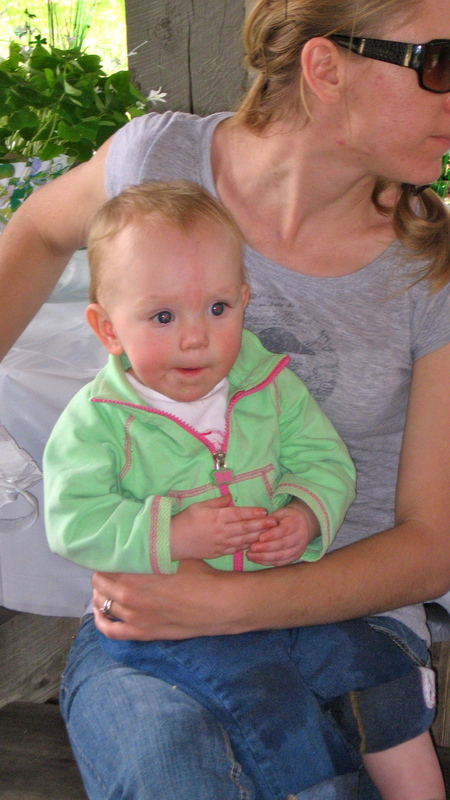 The children here also are familiar with them, as we have two in the Godly Play classrooms. 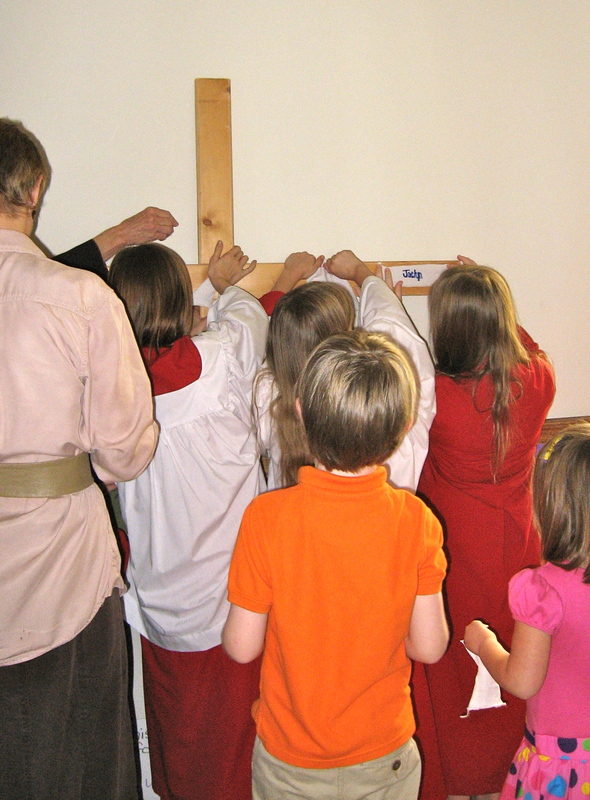 Our Good Friday liturgy also has the Stations of the Cross – meditations on 9 scenes in the last week of Jesus’ life. 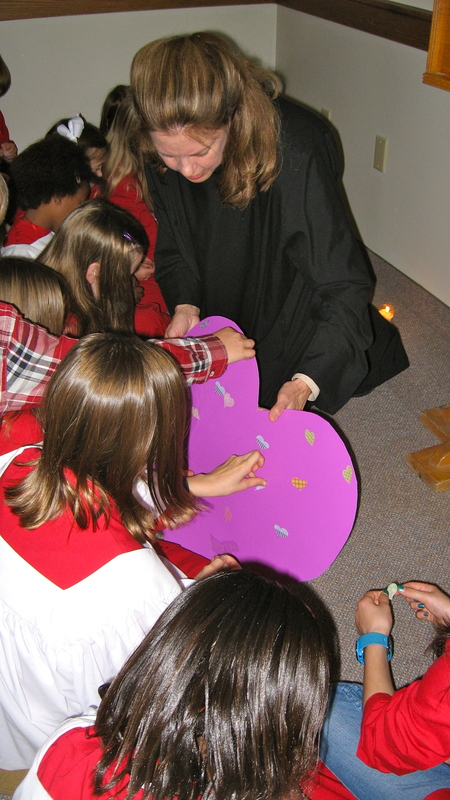 Diane gave the children 5th grade and younger a wonderful gift of Stations of the Cross suitable for that age group with a simple activity to fit each station. After hearing that Jesus’s clothes were ripped, each participant wrote his or her name on a piece of ripped cloth and pinned it to the cross. The final station describes the body of Jesus being taken from the cross and anointed with oil. 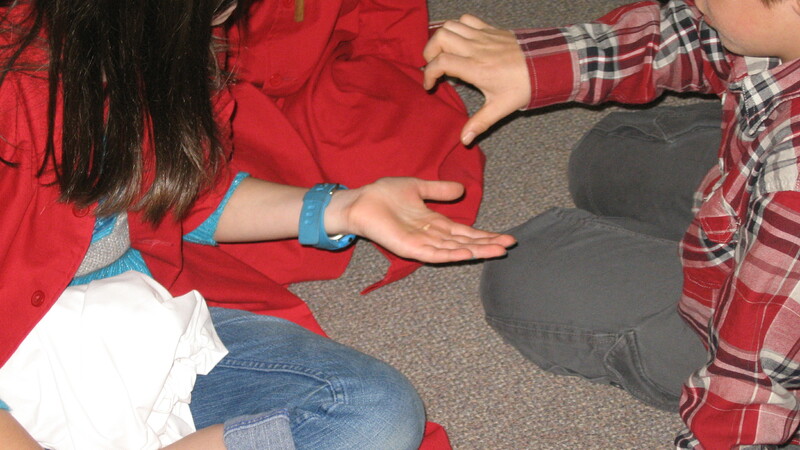 WIth a thumb dipped in olive oil, each participant silently made the sign of the cross on the hand of the person next to him or her. 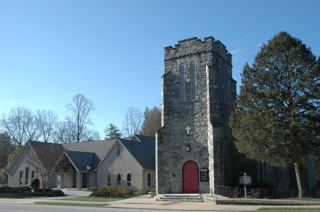 There is a new committee working at St. Philip’s with the acronym EPP (Episcopal Program Planning) – and those people have been PLANNING! 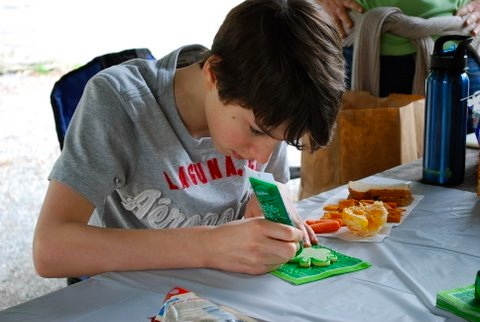 Some pictures of these fellowship events from March show up in this post. 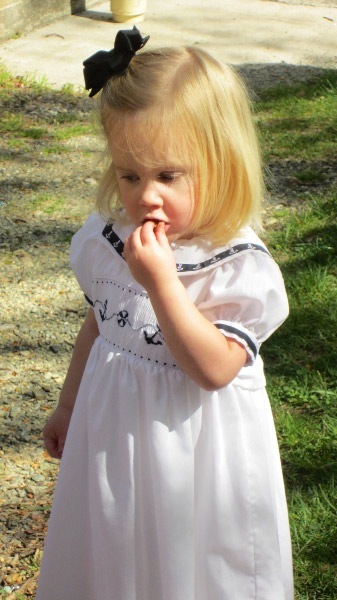 However, before we move to fellowship, there’s one little lost one we’d like to find a home for. 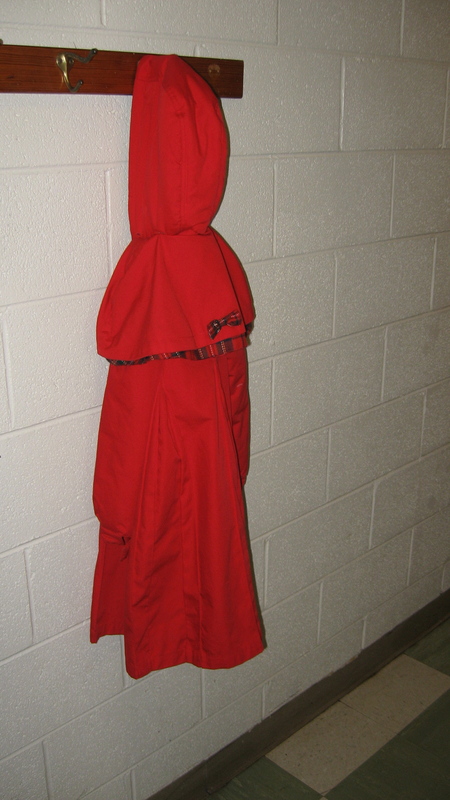 This little red child’s coat was left at St. Philip’s during Advent/Christmas. It’s now hanging a hook outside Steve’s office. If you recognize it, drop by and pick it up: we’ll give it a few weeks more and then take it to the Shop of St. Philip’s if no one claims it. Unless you’ve been living under a rock, you might have heard that parts of the new movie “The Hunger Games” were filmed in Transylvania County. There is no doubting the beautiful locations we have here! 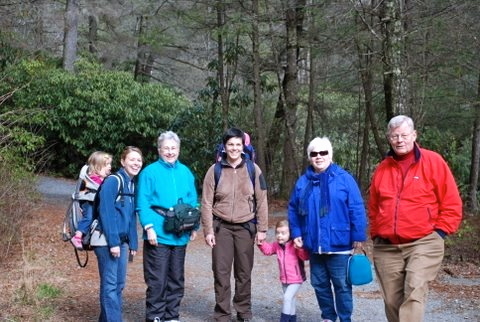 On March 3, several intrepid St. Philippians headed out to DuPont State Forest on a hike to see some of these beautiful parts of God’s creation. 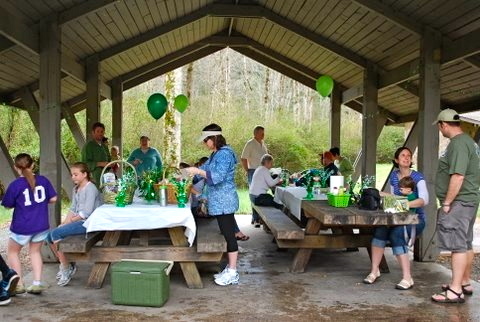 And just a few weeks later, more gathered at the shelter at Sycamore Flats for a St. Patrick’s Day Picnic! 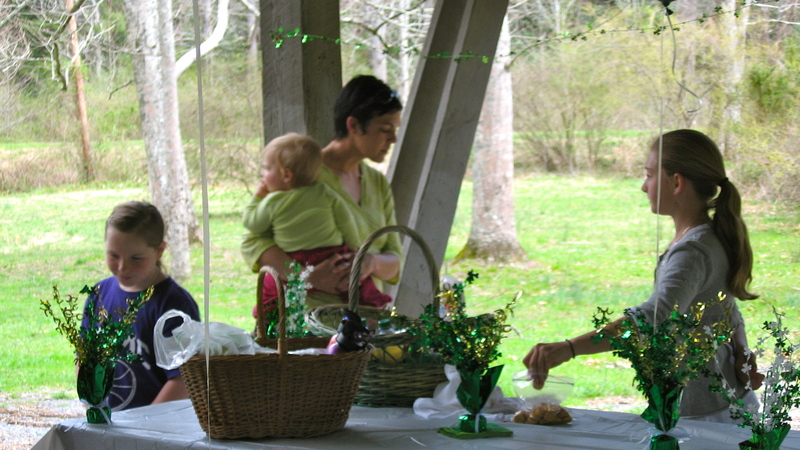 Green was busting out all over – the unseasonably warm winter we’ve had made for a great day in the Forest. Now, don’t think everyone spent all their time visiting and enjoying each other’s company. 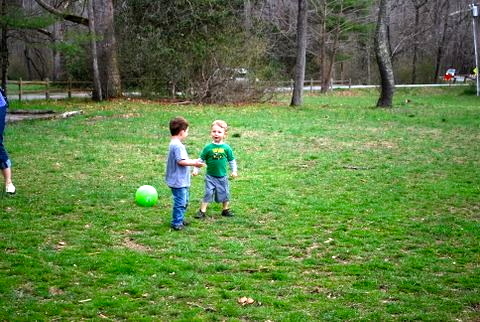 There was a whole lot of fun happening out on the grass! 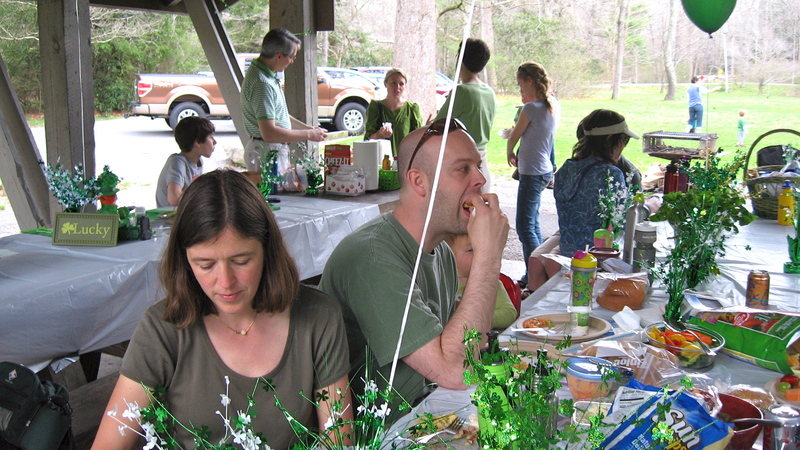 And, of course, there was a lot of green happening after everyone finished their lunch. 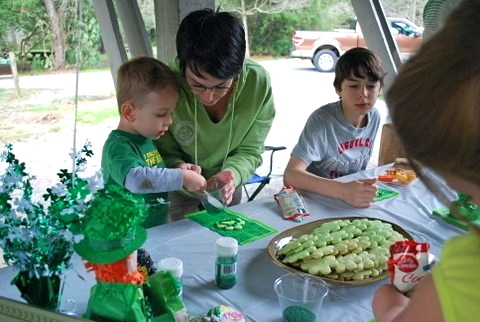 This important activity – decorating green shamrock cookies – required more concentration than you usually see at a picnic! Until next time, top o’ the morning to you! Enter your e-mail address to follow PhilippianPix and receive notifications of new posts by email. What Can We Leave Out…?